Recently developed Critical-Angle Transmission (CAT) grating technology – in combination with x-ray CCD cameras and large collecting-area focusing optics – will enable a new generation of soft x-ray spectrometers with unprecedented resolving power and effective area and with at least an order of magnitude improvement in figures-of-merit for emission and absorption line detection. It will be essential to answer a number of high-priority astrophysics questions and open the door to a new discovery space. Fig. 1: Schematic of the basic CAT grating concept. Absorption and emission line spectroscopy with the performance made possible by a well-designed CAT x-ray grating spectrometer (CATXGS) will target science objectives concerning the large scale structure of the universe, cosmic feedback, interstellar and intergalactic media, and stellar accretion. Kinematics of galactic outflows, hot gas in galactic halos, black hole growth, the missing baryons in galaxies and the Warm Hot Intergalactic Medium, and the effect of x-ray radiation on protoplanetary disks all pose questions that will be addressed by a well-designed CATXGS-carrying mission. CAT gratings are free-standing transmission gratings with ultra-high aspect-ratio grating bars. They can be described as blazed transmission gratings and combine the advantages of past-generation transmission (relaxed alignment and flatness tolerances, light-weight, transparent at higher energies) and blazed reflection gratings (efficient, enable use of higher diffraction orders). The basic structure of a CAT grating is shown in Fig. 1 in cross section. 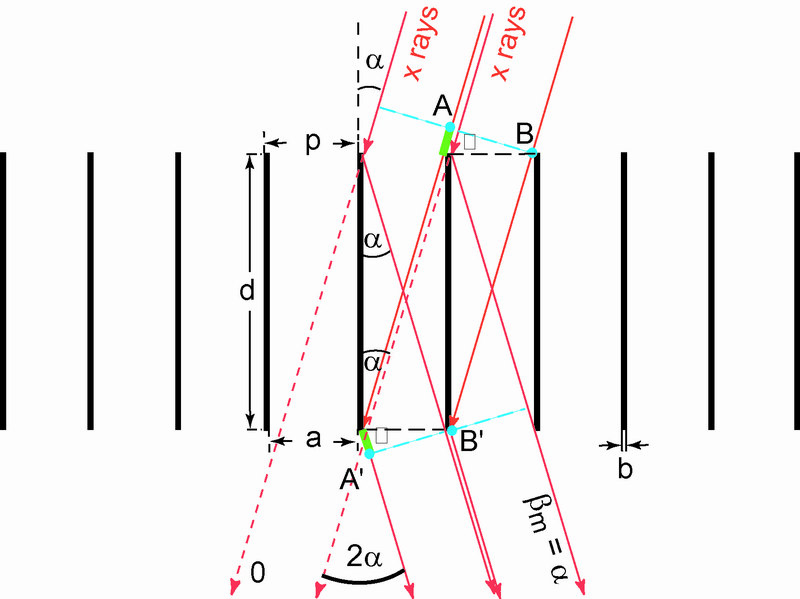 X rays are incident onto the nm-smooth side walls of thin, ultra-high aspect-ratio grating bars at an angle alpha below the critical angle for total external reflection. CAT gratings are challenging to fabricate. Typical straw man parameters are: Grating period p = 200 nm, grating depth d = 4 micron, grating bar thickness b = 40 nm, and sidewall roughness < 1 nm. The gratings also need to be free-standing (i.e. not supported by a membrane) to minimize x-ray absorption. This means the grating bar aspect ratio d/b is 100 or greater. We have demonstrated these parameters using anisotropic wet etching in KOH of silicon device layers on silicon-on-insulator (SOI) wafers. X-ray tests at the Advanced Light Source (ALS) have shown good agreement between theoretical predictions and measured diffraction efficiencies over a broad band. CAT gratings should be on the order of tens of square centimeters in area for practical applications in space-based x-ray telescope grating spectrometers (XGS). Thus the fine grating bars need a hierarchy of support structures – all as narrow as possible to minimize x-ray blockage. KOH etching alone does not allow sufficient control over the first level (L1) of supports, which are monolithically integrated into the SOI device layer. We have therefore developed a deep reactive-ion etch (DRIE) for the simultaneous anisotropic etching of grating bars and L1 supports. This step leaves the grating bar sidewalls too rough and needs to be followed by a short wet KOH “polishing” step. A much coarser hexagonal L2 support mesh is etched out of the thick SOI handle layer using DRIE. Details on CAT grating fabrication can be found in the papers by Bruccoleri, Mukherjee, and Ahn. CAT grating spectrometer design is described here. CAT gratings are covered under patent US 7,492,989.